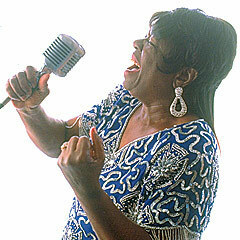 UPDATE: Koko Taylor passed away on June 3rd as a result of complications from surgery. See news on her website. Koko Taylor, 80, Grammy Award-winning “Queen of the Blues,” is recovering from surgery to correct a gastrointestinal bleed. The surgery was performed on May 19 at Northwestern Memorial Hospital in Chicago. Her doctors anticipate a full recovery. Taylor is not accepting visitors or phone calls at this time. Taylor’s most recent live performance was at the Blues Music Awards in Memphis, TN, on May 7, 2009. She performed her signature song, “Wang Dang Doodle,” after receiving the award for Traditional Blues Female Blues Artist Of The Year. This was Taylor’s 29th Blues Music Award, making her the recipient of more Blues Music Awards than any other artist. In addition, she has received the NEA National Heritage Fellowship Award, which is among the highest honors given to an American artist. Her most recent CD, 2007’s Old School , was nominated for a Grammy (eight of her nine Alligator Records albums were Grammy-nominated). She won a Grammy in 1984 for her guest appearance on the compilation album Blues Explosion on Atlantic Records. Loudon Wainwright III has created one of the most ambitious projects of his career with High Wide & Handsome: The Charlie Poole Project, out August 25 on 2nd Story Sound Records, examining the life, themes, and repertoire of the country music pioneer. Immortalized in the 2005 box set, You Ain’t Talkin’ to Me: Charlie Poole and the Roots of Country Music , Poole was a bootlegger, banjo picker, amateur baseball player, drinker, rambler, gambler, and textile mill worker — and one of the most popular musicians of his day, recording over 110 tracks for Columbia, Paramount, and Brunswick. Born in 1892 in North Carolina, he lived fast and died at the age of 39. He was not, however, a writer, drawing instead on popular and traditional repertoire for his recordings and performances. According to All Music Guide, “Poole’s talent for making it all seem like personal autobiography makes him very much a modernist, only a short leap away from an artist like Hank Williams.” This same spirit of reinterpreting popular and trdational repertoire to reflect the present as well as the past may be seen as the heart of Wainwright’s Poole project. Istanbulive: The Sounds & Colors of Turkey at SummerStage will bring together for the first time one of the largest-ever assemblies of musicians from Turkey on an American stage — five unprecedented hours of the most diverse and important music the nation has to offer. Concertgoers will also have the opportunity to sample vibrant Turkish culture and authentic Turkish food, as well as learn more about information on Turkey as a tourist destination. LOS ANGELES, Calif. ­ Fantasy Records continues its massive Creedence Clearwater Revival reissue program with the May 26, 2009 release of Creedence Covers the Classics , a compilation of the band’s best cover tracks, plus a fully remastered version of The Concert , the band’s 1970 live album. Last year, marking Creedence’s 40th anniversary, Fantasy re-released the Rock ’n’ Roll Hall of Fame-inducted band’s first six studio albums including rare never-before-released bonus tracks. Creedence Clearwater Revival had developed a vast arsenal of covers during a lengthy apprenticeship in the local Bay Area music scene (as Tommy Fogerty & the Blue Velvets and later as the Golliwogs) by the time they emerged on the national stage in 1968. As fans of the 1950s “Golden Age of Rock ’n’ Roll,” CCR hardly missed an opportunity to salute their musical heroes while making the songs their own. The Creedence Covers the Classics collection brings together for the first time these classic cover recordings. FM Odyssey Radio has set a goal to raise an additional $10,000 for the Prostate Cancer Foundation before June 21, 2009. You can help them achieve this goal. “Dan Fogelberg – A Retrospective Interview by Fred Migliore of FM Odyssey Radio” is a 2-CD limited-edition collector’s item featuring previously unreleased stories and insights from Dan Fogelberg as he reminisces his way through 13 full-length songs that include “To the Morning,” “Leader of the Band,” “Nether Lands,” “ The Last Nail,” and “Old Tennessee.” It is is available for $29.95 exclusively at: www. fmodyssey.com. Three dollars from each package sold is donated to the PCF to further research. If you haven’t purchased this fantastic keepsake, this is a perfect opportunity. The Sol Harvest Festivus for the Restivus will celebrate its seventh year July 17th, 18th and 19th as Northeastern Vermont’s “party of the summer.” For the first time, the groove-filled roots and world music festival will run for two nights and two days and will feature the danceable, joyful sounds of world touring acts Toubab Krewe, Oumou Sangaré, Barrington Levy, Midnite, Black Sheep and Earle “Chinna” Smith, as well as many of Vermont’s most enjoyable local talents. The Festivus, dubbed “The Manifestivus” this year to honor its larger scale, is held on 93 acres of breathtaking land in Cabot, six hours north of New York City and three hours from Boston or Montreal. Set on a gently rolling hillside meadow surrounded by forest, the timber stage creates an unforgettable vibe which last year hosted 1500 dancing, smiling, loving faces under a moonlit sky. The Festivus is founded by Toubab Krewe bassist David Pransky, and takes place on his family’s longtime farm. Legendary reggae group THE WAILERS will be heading out for a second round on their sold-out nationwide “Exodus Tour,” with dates on the East Coast and in Texas next month. The dates will feature a full performance of the classic 1977 album of the same name, Exodus , named “Album of the Century” by TIME Magazine, and featuring the anthem “One Love,” deemed “Song of the Millennium” by the BBC. The Wailers will be using the tour to bring more attention to their “I Went Hungry,” which donates unused funds from the band’s hospitality riders directly to the United Nation’s World Food Program. To date, the charity has already fed over 120,000 people. Tickets: $25 Advance / $30 Gate – Kids under 10 free! Food, fun and the best in acoustic blues and roots music in a beautiful farm setting just an hour’s drive from the Twin Cities! ST. PAUL, MN — Red House Records is pleased to announce its upcoming BLUES AT THE BARN event, being held on Saturday, August 1st in Red Wing, MN. Featuring the best in Americana blues from Austin, TX to the Twin Cities, the all-afternoon festival will include performances by grooving blues poet Ray Bonneville, Iowa City alt-country artist Pieta Brown, Prairie Home Companion favorite Dave Moore, indie-roots duo The Pines and The Brass Kings’ Steve Kaul. BLUES AT THE BARN will take place on the outdoor stage at Hobgoblin Music‘s converted barn, where the acclaimed music shop presents concerts, sells recordings and builds Celtic harps. An ideal setting for roots and blues music, Hobgoblin Music will host Red House’s new summer event appealing to the fans of the local label’s legendary Summerfolk Festivals. Perfect for the whole family, BLUES AT THE BARN is free to all children under 10 and is priced economically with advance tickets selling for just $25. BLUES AT THE BARN coincides with the City of Red Wing’s annual River City Days celebration, which runs July 31st – August 2nd. It’s the perfect time to travel to this historic river town named “One of The Top 25 Historic Destinations in The World” by National Geographic Traveler magazine. Juldeh Camara & Justin Adams, photo by York Tillyer 2009 Real World Records Ltd.
Adams is no newcomer to what some Westerners call “luck” or “coincidence” and some Africans call spirits, having alternated time in the Sahara with Tuareg bluesmen with time onstage as British rocker Robert Plant’s guitarist. The past decade has seen a convergence of the unnameable forces that guide the soul of rock and roll and the essence of Western African music forms. Camara’s evocative playing on the riti-a Gambian, one-string spike fiddle that evokes a diversity of sonorities-is unexpectedly compatible with Adam’s signature Clash-meets-desert trance guitar sound. The fluidity, spontaneity, and otherworldliness that define both spheres-rock and African-are palpable on Tell No Lies (Real World Records; June 9, 2009). Adams’ and Camara’s collaboration is filtered through the confidently bluesy grit and urban sensibilities of rock, desert grooves, and old-school R&B. “I wanted to take the music beyond the usual ‘nice’ sound of a lot of African records,” says Adams. To this end, Adams made a mix on his iPod for Camara-who also plays a Ghanaian banjo called the kologo-and for Mim Suleiman, a metallurgist-turned-singer from Zanzibar .